I am writing to you today regarding the actions of the Trump Administration and the issue of separating children from their parents in the southern United States as the Administration implemented its ‘zero tolerance’ policy of migration across its southern border. Specifically, after speaking with people in my workplace I am writing to you today asking you to act. The situation there has devolved into what Amnesty International has called ‘nothing short of torture’. Before President Trump’s executive order was signed, parents are detained and sent to jails while their children are taken from them and held in cages in vacant box stores. While he contends this practice may temporarily be halted, this is not the only egregious practice occurring as a result of their new immigration policies. While we understand there is nuance in international diplomacy we must make clear that there is no nuance in our morality of our community and those elected to represent it. I ask you to speak out on behalf of outraged residents across the country. 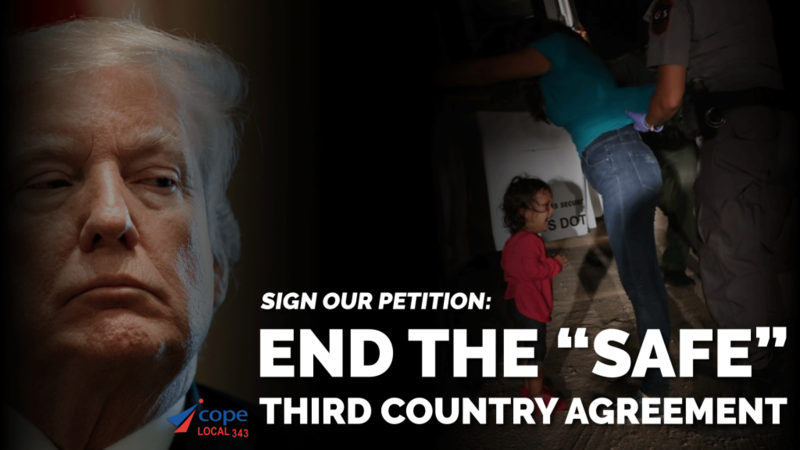 I ask you to respond with a commitment to support the suspension of the safe third country agreement. Make no mistake about it I entirely understand the political pressures you face with such a decision. While I understand those pressures I also understand that the pressure of knowing in good conscience that is wrong and standing idly by must surely be heavier. Thank you for your time and attention and I look forward to sharing your reply with those in our community I have spoken with. Would you like to be informed via email by COPE 343 regarding this campaign and others?